The earliest paper sewing patterns were pre-cut on plain tissue, with notches and holes for markings which aided in construction of the garment. The printed pattern was introduced in the 1920s, but did not become commonplace until just after World War II. There are four large pattern companies still making sewing patterns today: Butterick, McCall’s, Simplicity and Vogue. These are also the most commonly found vintage patterns, though there were dozens of smaller companies who produced some wonderful designs. There are all kinds of vintage pattern collectors. Some collect designs from just one era, the 1960s Mod look for instance, that may suit their body shape or their lifestyle. Others collect certain designers. I know one collector who buys just the Butterick Young Designers from the 1960s and 1970s. She became interested in these because she has fond memories of sewing them back in her youth. Some collectors love the Hollywood brand. Their envelopes featured Hollywood starlets in the 1930s and 40s. Some of these patterns are loosely based on designs from the movies. Others were meant to reflect the style of the star pictured. Still others had nothing to do with the starlet pictured, as in one that has Bette Davis on an apron pattern. Pattern magazines and counter books (the big books in stores which showed all the styles) are also interesting to collect, and they are invaluable aids in helping to place a date on a pattern. When buying vintage patterns there are several things to keep in mind. If you’re paying more than a few dollars you need to ask if the pattern is complete. An accomplished sewer may not mind a few missing pieces, but most of us need them all. If you have found some patterns you like but the seller has no idea if they are complete, at least check to be sure the instructions are in the envelope, and see if you think the folded tissue is thick enough to match the number of pieces indicated on the envelope. Also make sure the back of the envelope is intact, as it has valuable information such as the amount of fabric you’ll need. It’s rare (but nice!) to find vintage patterns in pristine condition, but sometimes you can find unused ones that still have the original folds in the tissue. These patterns are “factory folded” and they are a real treat to find. There is no guess-work about completeness with a factory folded pattern. On the other hand, well-used patterns can still be valuable and usable. If the design is fantastic, unusual or rare, condition may not be as important. However, poor condition and incompleteness do affect value, so pay accordingly. And for an ordinary design, it might be better to wait for a copy in better condition. Remember, these were manufactured by the thousands! If you want to know when your pattern was made, there are several ways to find out. The easiest is when the maker has put the date on the envelope or on the instruction sheet. McCall, later McCall’s, patterns are always dated. Look along the edge on the back of the envelope, or sometimes on the flap. 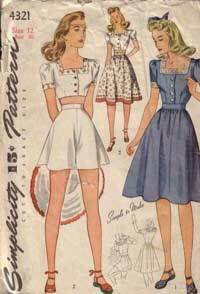 Simplicity patterns were dated in the 1940s and into the 50s, on the instruction sheet. Look at the bottom corners to find the dates. Simplicity stopped putting dates on most patterns in the early 50s, but in the mid 1960s they began printing it on the envelope back. Vogue patterns were rarely dated, and until the late 1970s, Butterick patterns were never dated. Most mail order patterns were not dated, though you could get lucky and find one in the original mailing envelope with a postmarked date. The other smaller companies did not put dates on their patterns. And be careful, because sometimes an older pattern will have a copyright date that is not for the design, but for a feature like the method of construction. I’ve seen obvious 1930s designs with a 1921 copyright date. Another way to date a pattern is by using the number of the pattern. There is a book series, Blueprints of Fashion by Wade Laboissonniere, that attempts to make sense of all the different numbering systems. Sometimes the only way to determine the age of a pattern is from the styling of the illustration. The hairstyle, the garment style and length, even the printing fonts used can be hints as to the era of a pattern. This is when knowing a bit about fashion eras can be valuable. Some people buy vintage patterns simply because they love the beautiful designs, but many people actually use their patterns to make clothing. The tissue and instruction sheets can be very fragile due to age, but most patterns I’ve found are usable if the sewer exercises caution. In order to make your pattern last longer and to preserve your investment, you might want to make a copy of the pattern. Instead of using the actual pattern to cut out the pieces, use the copy, saving wear and tear on the more fragile original. I bought a bolt of interfacing fabric that I trace my pieces onto. It’s easy to transfer the markings because the fabric is translucent. I’ve heard that some people trace their pieces onto tissue, which would work as well. You can find vintage patterns almost anywhere you would be shopping for used items. This includes every venue from yard sales to antique shows. Yard sales and estate sales are excellent sources of vintage patterns. I went to a yard sale recently where an elderly lady was selling her lifetime collection of patterns. She was able to tell me what fabrics she used for each one, and if the dress was made for a special occasion, what it was. It’s fun knowing these patterns will continue to be appreciated! A hint when buying at yard sales and estate sales: if the price is reasonable, buy all the patterns, especially if they are messy looking. Home sewers frequently “mixed and matched” patterns – taking a bodice from one and putting it with the skirt from another. Often the pieces were not returned to the correct envelope, but if you have all the patterns, you may be able to locate any pieces that are missing from each envelope. Thrift stores may be another good source of vintage patterns, however, some thrifts do not see the value of them and will throw them away. You must educate your thrift workers! Ask them to save any patterns they get instead of dumping them. A thrift store near me refuses to sell patterns, but they are smart. Instead of filling their dumpster with them and other “unsalable” items, they keep a “free” box outside the shop. I’ve found some wonderful patterns in that box! Flea markets are great sources for patterns. Look in booths that have other “girly” or clothing items. And if you don’t see them, ask. They may have a big box at home, or better still, under the table. Again, be prepared to educate. Many flea dealers do not know there is a market for vintage patterns. Just a few months ago I was told by a dealer that she just threw away a big cabinet full of old patterns. Antique malls and shops and vintage clothing stores are also great sources for vintage patterns. Amazingly, patterns in these shops are usually very reasonably priced – often just a few dollars. And if you don’t see any patterns, especially in a one proprietor shop, be sure to ask if he or she has any tucked away. 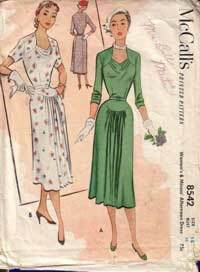 Today, one of the best places to find vintage patterns is online, especially if you are searching for a specific pattern. There is a vintage pattern category on eBay, but there are also quite a few small websites devoted to the selling of vintage patterns. In buying from these sites you are dealing with someone who knows patterns and who can give you good advice about any pattern you are considering. You can also be assured the pattern is complete, or that it is as the seller describes it. Whether you buy vintage patterns to sew with or just to admire their beauty, if you are a fashion lover, it is likely you will find them to be as fascinating as I do! All images in this article courtesy Lizzie Bramlett of Fuzzylizzie.com. 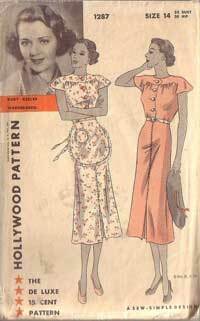 Vintage patterns are a great and inexpensive way to have your own little catalogue of fashion. Fabulous idea to make copies of the patterns – keep the original to admire! Thanks! Everything old is new again! If you want to have a completely original and unique look while being on the cutting edge of fashion, vintage patterns are the only way to go! And if you don’t sew for yourself, you can always hire a seamstress to do the work for you. I’ve had clothes custom fitted by a seamstress and there is nothing in the world like it. You will be on cloud nine! I have a large number of patterns dating from the 1960’s. They are mostly Vogue and a lot are Vogue Original or Vogue Designer Original. I don’t want them any more myself, but want them to go to an appreciative home and wonder if you know the best outlets for me to approach. I live on the east coast of NSW Australia. Great Article! I really Enjoyed the knowledge encased! I sell Patterns online, and it is always neat to find such great information, Thank you! I have many vintage patterns, many of which are for wedding dresses. My grandmother was a wonderful seamstress in her day and sewed for everyone in the neighborhood. She’s kept most of the patterns and was always very careful with everything she did. Sadly she has passed away and I’d like to be able to sell these patterns to someone who would use them and cherish them like she did. I’m not sure where to sell them at so if you are interested in them or could guide me in a direction to where I could sell them, I would sincerely appreciate it. 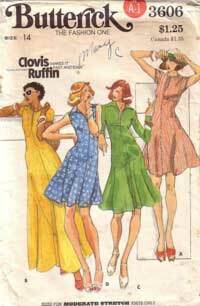 I have a large collection of sewing patterns from the mid to late sixties up to the mid nineties. My mother, whom passed a little over seven years ago, was an excellent seamstress. Not only did my sister and I always have original formal dresses for high school dances, she also did alterations, made silks for horse jockey’s (we live in Louisville, KY, home to the Kentucky Derby)as well as having her own embrodering business. I would like to pass these on to someone who would gain as much pleasure as she did. I’m not sure if there is a monetary value to them but if so any monies received will be donated to the St.Jude”s Foundation in her honor. Only serious inquires please. Fabulous article. I’ve set up a business to sell my mum’s old and vintage sewing patterns. It’s an amazing learning curve as I’m a non-sewer but I love the fact that I’m now able to learn to sew and do other crafts with a real purpose. I have to confess I love the old fashions and would love to make some of the outfits. I have a 15 glass drawer oak pattern cabinet that was used for storing butterick patterns. I have been told that they stopped using this type cabinet before WWII. Anybody know its worth? I’m a fashion student who is interested in collecting Vintage Patterns. I would be happy to make a donation or trade for any patterns. This last weekend I was having a garage sale and put a box of Christmas decorations in that my father in law had given me from a flea market. I didn’t notice until this lady came in and was looking at it and was salivating at the idea that the ornaments were wrapped in sewing patterns. I hadn’t noticed. I started to look through it but it didn’t look like much… didn’t look complete, it was ripped and the ornaments weren’t that old. I sold her the box for $2 because I was just wanting to get rid of stuff at the end of my sale. Did I make a mistake? I found a huge garbage bag of old patterns in the basement when we were getting ready to sell my parents house. I know that some of them were my mom’s before she got married but most were her sister’s and her mother’s and a friend of her mother’s. I know this because a lot of the patterns were ordered through the mail and still have envelopes with names and addresses on them. I also have all my mother’s sister’s old pictures since she passed away in the 40’s, when my mom was still in college. I believe there are pictures of her wearing the clothes she made from these patterns. These old pattern pieces have no printing on them so I have had trouble matching up any stray pieces that may have fallen out of the envelopes. A lot of the envelopes are torn or tattered or discolored. I was wondering if they are worth anything if they are in poor condition. I enjoy looking at them but would probably never try to actually make anything from them. My mother’s newer (50’s on) patterns and my patterns (60’s – 70’s) are not in as poor condition and have been stored in the house. My mother used to sew all my clothes until I was able to sew for myself. I actually did make a few dresses from vintage patterns when I was in high school. Someday I may fit into them again – I still have them. My mother and I both got degrees in Fashion Merchandising. In her day she had to take tailoring classes and fiber content as well as the business classes and fashion history. I also have all her old school notebooks and projects which I find fascinating to look at. Much more so than any of my school stuff. I could not bring myself to throw any of this carefully saved stuff away but I don’t know what to do with it. I kept thinking some fashion history major or library would be interested. I also have some of the pattern catalogs, mainly 60’s – 70’s. Some are the smaller ones that you could buy and a few of the big, counter books that the store would give away when the new ones came out. I also have some patterns that a store was throwing away when the new patterns came out. They were required to destroy or send back the pattern jackets, so I have all the intact pattern pieces folded inside the instruction sheet. I wonder if these are worth anything? Sorry this got so long. I am just thinking about all this history I am sitting with and don’t know what to do with it. Any ideas would be helpful. I am trying to find out what the little pillows were called that had the image of an animal or doll printed on them. The two sides were just sewed together and stuffed. My wife had one that looked like a little girl holding a doll by the hand. I want to find one if I can. We found a box of my mother-in-laws old patterns that I was going to donate. Like most people I don’t want to donate something that might have monetary value. I have 7 envelopes from “The Minneapolis Morning Tribune” with the old patterns with the holes, clips as instructions. Are these more valuable as an antique rather than a pattern? I also have of doll clothes patterns, 8″, 14″, 20″, Barbie and Ken and 2 that are called “Movie/Film Star” doll clothes. Your thoughts? Hi, I am in the process of moving home and have come across an old suitcase of my Mums full of old sewing patterns (Butterick, Simplicity, Style). Could you let me know please if you know of anyone that collects these as its such a shame to throw them. I along with many people I’ve seen in the comment section. I too have large collection of old dress patterns. I decided to hold onto them, hoping I’d find someone in search for vintage patterns. Since they were hers (grandma) I’d like to see them appreciated. I have many different patterns by McCall’s, Simplicity and so forth from the early 60’s. They were my Mother-In-Law’s and in really great shape. I don’t want to through them away. Would love to give them to someone. Please let me know if anyone is interested. The first person to message me their mailing address, they will be mailed out as soon as possible. No charge. Just want them to go to a good home. 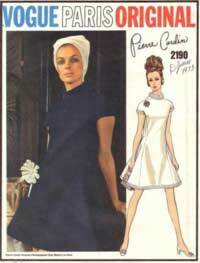 I am looking for vintage butterick pattern 2533 i don’t care if it is not the oringnal. I have Inherited all pf my Mother’s patterns. Will look and see if she had that paatern. If you still have those patterns I would be interested to have them. I am not sure how to connect with you. What are the copyright rules/laws with vintage patterns? Can covers be scanned and used? If u scroll back up to comment #13-pam,;it was back in 2013 she made this comment.I was just wondering what she ended up doing with it? I am also in the same position ,only my ma was a sewing instructor ,&also the girl in the window at Sears in Edmonton,Canada,doing sewing demos.so know I was left w/ALOT! JUST CURIOUS?!!! We are a non-profit sewing pattern library in the U.K. which has been set up for the preservation of vintage sewing patterns for generations to come. If you would like to donate any sewing patterns, we are happy to cover the cost of postage. Contact me at http://www.vintagesewingpatternlibrary.com through our contact form.